Journey into Space by Marnie Willow - spacekids - space toys, dressing up costumes, kids spacesuits, astronaut food, cool space stuff! Blast off on an incredible space adventure! 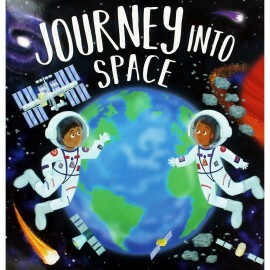 Join bold explorers Max and Rosie as they prepare for a daring journey into outer space. Their mission is to bring important supplies to the International Space Station, but first they have to master astronaught training, steer a speeding rocket and cope with zero gravity. Based on real-life astronauts' experiences, this thrilling adnvetyre teaches children all about how scientists train, take off, and live and work in space.